We have just entered into the year 2017 and it is already going by fast. It’s now time to stop summarizing the achievements made in 2016 and begin observing the latest trends in the mobile app testing sphere. Ubertesters’ marketing team have collected 5 trends which you should keep a close eye out for. After years of being pushed aside in favor of other areas of IT security, mobile app security testing has become the headliner. Ordinary users stopped clicking on strange links, and started reviewing files before downloading. They look through the small print to get a clear understanding of the app’s permissions and usage of safety protocols, such as two-factor authentication. With that being said, mobile apps still have a lot of security holes which can lead to the loss of personal and financial information. According to the 2016 Checkmarx review, 84% of cyber-attacks aimed to penetrate the application layer. The Internet of Things (IoT), has opened up a world of seemingly endless possibilities where we can control many aspects of our lives with our mobile and desktop software. Furthermore, a new class of devices has brought an altogether different set of rules for UI, UX and user behavior (UB) patterns testing. Google’s self-driving cars are a prime example of this case. A user’s life depends not just on the driving rules but also on the style and driving habits within a specific region. We can expect the same situation with Android Instant Apps (AIA). This new technology will help users start working immediately, not with the whole app, but with some relevant parts of it. This consequently leads to new issues surrounding the local user’s behavior and way of thinking thus requiring more time for testing activities. Mobile Apps are becoming the backbone of business for many organizations. In fact, the trend to launch a business based on a mobile app is increasing rapidly. In such situations, traditional models of mobile apps development have become utterly useless. Development cycles have become shorter and shorter, based on permanent user feedback. Agile Development cycles and continuous delivery and deployments will become the key to success in each mobile project in 2017. Mobile e-commerce has become an integral part of businesses nowadays. This year we can forget about the traditional online payment terminal, PayPal (or just use it less frequently). New types of payment options such as, Samsung Pay, Microsoft Wallet, Apple pay and so on, based on internal proprietary protocols, will be used more frequently. 2017 will bring more challenges yet greater possibilities for mobile QA specialists. New technologies will require completely different approaches for testing and certainly more time for reviewing and fixing app’s functionality. 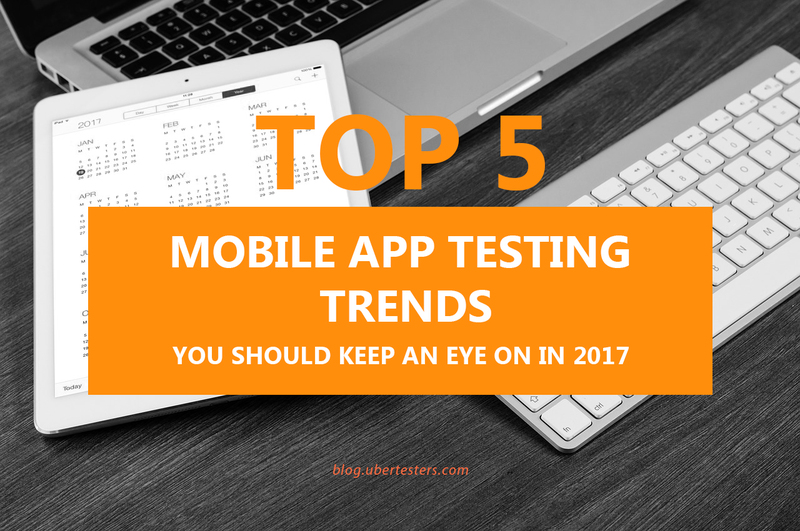 We hope that these 5 mobile app testing trends will help you to stay focused in your nish.